Edaris Health’s UrgiChart has achieved Office of the National Coordinator for Health Information Technology (ONC-Health IT) 2015 Edition Health IT Module Certification via Drummond Group LLC, an Authorized Certification Body (ACB) that has been empowered to test software for compliance with the requirements of the federal government’s program. The stamp of approval designates that the software offers the functionality that enables eligible providers and hospitals to meet Meaningful Use requirements, qualifying these organizations to receive payments under the ongoing EHR adoption program. How does a practice differentiate itself - make it attractive to a hospital system - and become affiliated with them? An Urgent Care Physician’s Perspective: What does surge mean for Urgent Care? When physicians sketch their vision of running an urgent care clinic, they may think that having a crowded waiting room would be a “good problem to have.” But when that reality hits – and the crowded waiting room gets even more crowded, it is imperative to have a surge plan in place, so that patients, physicians and staff know how to recognize a surge situation, and know what to do to avoid negatively impacting patient care or clinicians themselves. Surge goes beyond simple supply-and-demand; it is a serious and complex phenomenon. While it is most often associated with Emergency Departments, surge can happen in urgent care environments as well. 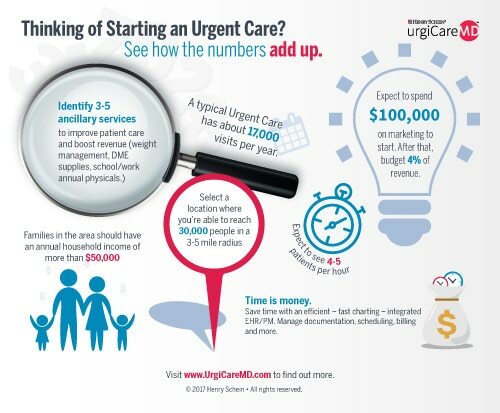 Thinking of Starting an Urgent Care? Dr. Lawrence Earl, a leading expert on urgent care management and a highly regarded mentor in this fast-growing field, has gathered some facts and figures to help guide physicians who are considering opening an urgent care center. It’s imperative to think beyond the medical opportunity. While starting an urgent care center gives the practicing physician a chance to provide care in a specialized setting, and fill a gap in the market – it’s also important to fully understand the economics of this major undertaking. Just as any retail operator knows, branding, location, staffing and the portfolio of products and services offered must add up to a successful formula in order to meet customer needs. Summer: Sun, Fun and …. Urgent Care! The time-honored traditions of summer – vacations, backyard barbecues, pool parties, visits to the beach and lots of time outside – can easily lead to unforeseen medical situations, many serious enough to require urgent attention. One of the first questions a physician asks himself (or herself) when considering opening an Urgent Care center, is whether they should embark on this journey alone, or as part of a team. Go it alone? Franchise? Partner? We’ll leave the franchise discussion for another time, and focus on the pros of working with a group of like-minded physicians and/or business partners. (Waltham, MA) –Wednsday, April 5, 2017- Edaris Health, a leading provider of cloud-enabled SaaS services for healthcare, today announced a partnership with athenahealth, Inc. through athenahealth’s “More Disruption Please” (MDP) program, making Edaris Health’s UrgiChart EHR and Clinical Solution part of the athenahealth® Marketplace. This new integrated application offers athenahealth’s growing network of nearly 88,000 healthcare providers a complete, yet intuitive, clinical documentation tool for Urgent Care clinicians looking to deploy a best-in-breed solution for their practice. Edaris Health is a preeminent electronic clinical documentation, display and decision support software and services company that provides SaaS-based solutions to Urgent Care facilities and Emergency Departments. Edaris Health’s sophisticated display and analytics platform transforms disparate clinical data from Urgent Care Centers and associated continuum of care health networks into critical, timely and actionable information allowing health care providers and their leadership to make better informed and effective decisions on the clinical management of their patients.